Very Very Vicky: Big, Bold, Colorful and Happy--Thanks Bellamy! Don't you love beautiful art? My mom started our art collection when she painted a picture for me and my husband as a wedding present. Through the years we have purchased paintings when traveling as a special remembrance of a wonderful trip and we also have collected paintings of our hometown of Savannah. It always gives me a little lift when I look around my home and see them! Back in October when my husband asked what I wanted for my birthday I said I wanted a Bellamy Murphy painting. I'd been checking her blog, looking at her website and admiring her work for a while and she had become a favorite artist of mine--her work makes me feel good and it evokes such strong feelings in me of growing up along the coast! 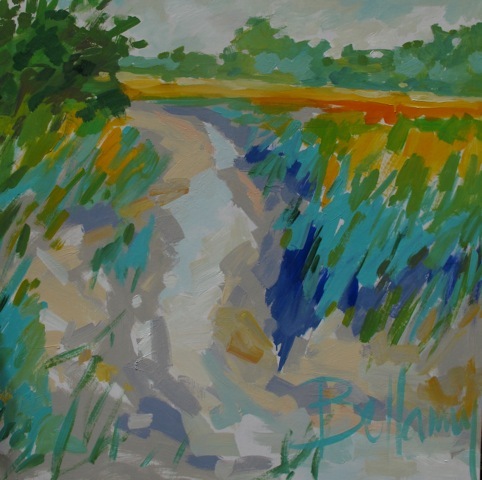 "Marsh Near The Isle of Hope"
Bellamy had painted a smaller version of "May Day" that was on display in her studio and it was perfect for us (mine is 40" x 50"--a good size for our cottage). The yellow chair in front of the painting is the style we are planning to use at the dining table. This painting will be the focal point across the room when you walk in the front door. I wanted it to be big, bold, colorful and happy--with all the beachy colors I want to use in the cottage. I think I chose well! How do you like it? I love it!! I like the marsh as well! Thanks Becky! It was a tough decision because all of Bellamy's work is so lovely. I love the "Marsh Near Isle of Hope" one too! Oh MY!!!! just back from 6 wks sailing the caribbean and catching up on your new camp house!!! whoa babeeeeee....too cool!!! Loving every ounce of it and now OMG....I MUST have that Bellamy of the fish for my lakehouse...going right now to her site!! You are an awesome designer with such a good "eye"!! Isn't it fantastic! I love it too! Please be sure to tell Bellamy that you saw it on my blog! I love the Oyster paintings, and I don't even eat seafood. haha So many beautiful pieces! I love the happy colors in yours and am excited that you're doing such a fun beach cottage!